Aremiti - View timetables, Compare and book ferry tickets at directferries.ie. 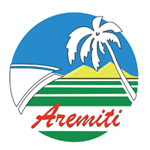 A family owned company, Aremiti ferries were created in 1991 and are headquartered at Papeete, the capital of French Polynesia, with a mission to effectively transport passengers, goods and vehicles between the two islands. The crossing between these two amazing islands takes between thirty and forty minutes with around five rotations per day. Over the years, their fleet has been renewed and improved allowing them to offer a faster and more comfortable crossing to their passengers. The current Ameriti ferry service utilises two high-speed vessels - the Aremiti 5 and the Aremiti Ferry 2. The 56 metre Aremiti 5 is the smaller, faster of the two ferries and can carry up to 697 passengers and 30 light vehicles and thanks to the latest-generation stabilizers navigate the journey in true comfort at a speed of more than 30 knots. On-board you’ll find air-conditioned rooms, a snack-bar and a large flat screen tv. Up top you’ll find a seventy seater sun deck, great for sightseeing during the trip. The 80 metre catamaran Aremiti Ferry 2 is the flagship vessel and can carry up to 967 passengers and 146 vehicles. With 2 air-conditioned decks and a large restaurant area, this is the most spacious of the fleet. Like its sister ship, there is also a sun deck up top.